The World Trade Centre will be showcasing The Critical Image, a group exhibition by four contemporary UK-based artists from Monday 24 June until Friday 6 September. The exhibition explores the cultural and critical durability of media and genre – focusing on the importance of abstract painting, installations and sculpture in response to claims of contemporary art’s alleged “post-medium condition”. William Henry’s surreal installations and object-based practice explores post-Duchampian ideas of the readymade and the estranging effects of otherwise familiar objects when subjected to artistic re-imagination and re-invention. Tim Meecham’s installation-based work evocatively plays with the registers of place, location and nostalgia at a time of supposed global interconnection and cultural displacement. Angus Pryor’s expansive canvases present narratives of the imagination – images of excess, violence and dysfunction which underline a critical re-invention and re-engagement with the language of painting. Georgia Wright provides the exhibition’s sculptural component through a range of playfully suggestive and subversive works which explore the resonance of highly tactile objects and their psychological and psychoanalytical associations. All the exhibitors are members of Plastic Propaganda, a contemporary art collective established in 2009 by William Henry, a UK-based installation artist and sculptor and by Angus Pryor, Reader & Head of the School of Art & Design, University of Gloucestershire. The collective has previously exhibited and showcased work at a range of venues throughout the UK and internationally, including West Wintergarden at London’s Canary Wharf, Tower Bridge, and more recently, New Delhi and Taiwan. Although Plastic Propaganda aims to be open and inclusive in ethos, it recognises in particular the cultural contribution of what has been described as a “post-conceptual generation” – those typically born in the 1960s and 1970s, for whom the legacies of both the Duchampian readymade and late modern responses to the art criticism of Clement Greenberg are cultural givens – long since internalised and accepted as part of an ‘expanded field’ of cultural production. Both these strands underpin a range of critical and aesthetic concerns, including, for example, the durability of figurative and abstract painting, approaches to printmaking and engraving; the re-definition of sculpture and other object-based art forms such as installation. As a peer informed and supported platform, Plastic Propaganda, believes in learning and engaging by practice; offering both contemporary artists and art history students opportunities to exhibit and to publish work as part of their onward professional and personal development. As Dr Grant Pooke, Senior Lecturer in Art History at the University of Kent, notes: “Emerging practitioner-based collectives like Plastic Propaganda recognise the changing nature of art not just in the UK but internationally and globally. In doing so it offers a considered approach to more inclusive and critical forms of visual art practice”. 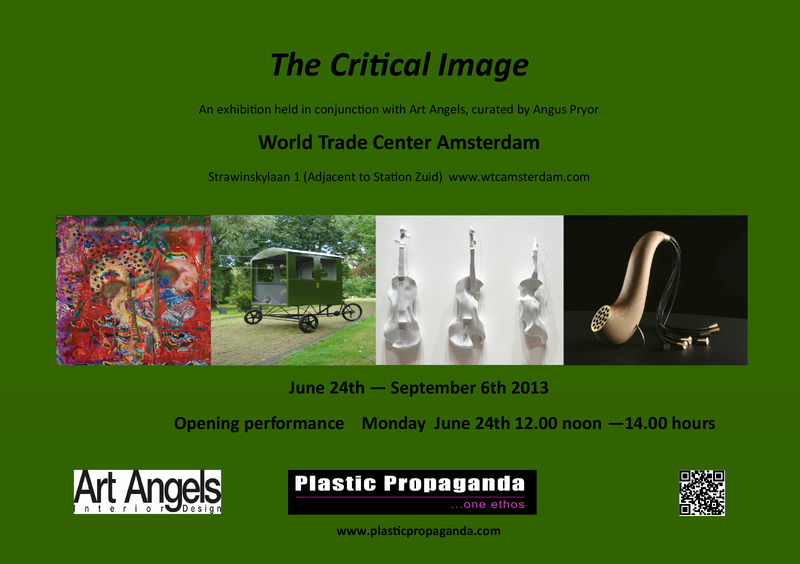 The Critical Image is on display at the World Trade Centre between Monday 24 June and Friday 6 September 2013. For further information contact William Henry on 00 44 7775916737.